How will sea level rise influence California’s coastal real estate markets in the coming years? 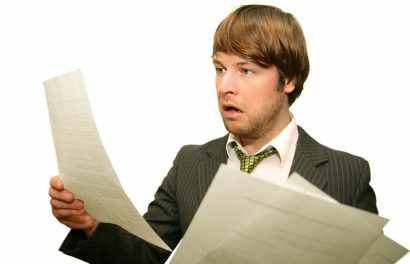 Should homebuyers beware? This article is the second in a three-part series on the effect of natural disasters on California’s real estate market. For Part I of the series, see: Drought. Over the past century, oceanographers in the Bay Area have measured an 8-inch sea level rise. However, the next 100 years are anticipated to see sea levels rise by four-to-five feet along California’s coastline, affecting 480,000 people and endangering property valued over $100 billion. This is under a medium-to-medium-high greenhouse gas scenario, according to the Pacific Institute. Of course, much of California’s shoreline is located along cliffs and dunes, rising well above sea level. So, four or five feet doesn’t seem like such a big deal to property built along, say, Highway 1. But cliff properties aren’t immune to the effects of sea level rise, due to the increased erosion inevitable with higher waves. Waves and changing currents are expected to cause increased coastal erosion across the world, particularly damaging California’s central and northern coast. Water will chip away at cliffs and dunes, carrying away sediment at the base and eventually causing masses of rock and earth to fall into the sea in landslides, suddenly or more gradually over time. Any property perched close enough to the edge will likewise disappear into the waves. 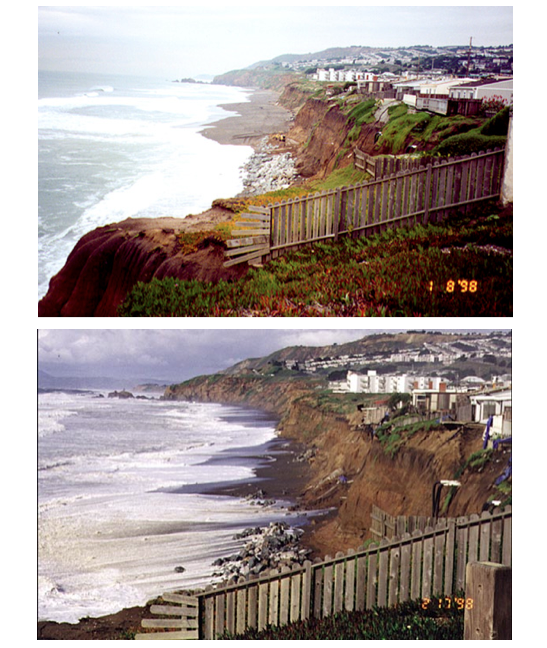 The images above are two photographs of the same seaside community near Pacifica, taken one month apart in 1998. Severe storms from El Niño hammered the coastline, resulting in rapid erosion alarmingly close to private residences. Seven homes fell into the sea, and 12 more were condemned in Pacifica as a result of that storm season. This type of erosion will occur with increased frequency when higher sea levels worsen the effects of storms. A study by Environmental Science Associates (ESA) covering 900 miles of Central and Northern California’s coastline found coastal dunes will erode inland an average of 510 feet by the year 2100. Coastal cliffs (which make up over 70% of California’s coastline) will erode an average of 200 feet by 2100. This translates to a loss of 20,000-25,000 acres. In the next ten years alone, cliff and dune erosion will result in about 6,700 acres lost. However, if California’s government acts quickly, they may forestall or lessen the long-term impacts of erosion on the coastal landscape. What is California doing to combat sea level rise? Sea walls are built to absorb ocean waves before they reach the actual shoreline. These vertical walls reduce erosion and protect the homes on the cliffs and bluffs beyond the walls. However, sea walls are a big problem for beach lovers. preventing the renewal of public beach as sea level rise overtakes parts of the beach. Revetments are sloped structures, often made of large rocks piled between a beach and its boardwalk or roadways. These are cheaper than seawalls for cities and private citizens to construct, but also receive similar criticisms. The Coastal Commission has actually limited the private use of sea walls by capping the time a permit allows sea walls to exist. The most common length of time allowed is twenty years (an arbitrary length of time, which was actually why a court overruled the permit cap in one case). After the twenty-year limit is up, the Coastal Commission has the authority to deny a new permit if it determines the beach in the affected area is rapidly disappearing or if the stability of the affected cliff or bluff is threatened. Erosion occurs at an historical rate of about 1.5 feet per year along the north side of the San Francisco Bay, and around seven inches per year along the south side of the Bay, according to the U.S. Geological Survey. The threat may seem small on a short-term scale, but a big storm can make erosion occur faster, as experienced in Pacifica. Further, the rate of erosion will increase dramatically in the coming decades. In fact, by 2100, San Francisco’s sea level is estimated to be five feet higher than its current level, on a still day. During big storms, this could rise to 32 feet above today’s sea level, according to ESA. The coast of Monterey Bay is a mix of cliffs, dunes and beaches. Here, cliffs erode at an historical average rate of 1.5 feet per year, and bluffs erode at 5.5 feet per year. Like elsewhere in the state, this pace of erosion will undoubtedly increase with sea level rise. Southern California is less susceptible to erosion, since flat beaches are more the norm than towering cliffs. Interestingly, beaches are also the result of erosion, but show the positive effects. All that lost sediment has to go somewhere, and sediment lost to erosion elsewhere often ends up on sandy beaches. Erosion occurring around Santa Barbara is quite low for the state. That’s because, as it’s both highly and wealthily populated, seawalls have been constructed to protect much of the coastline. 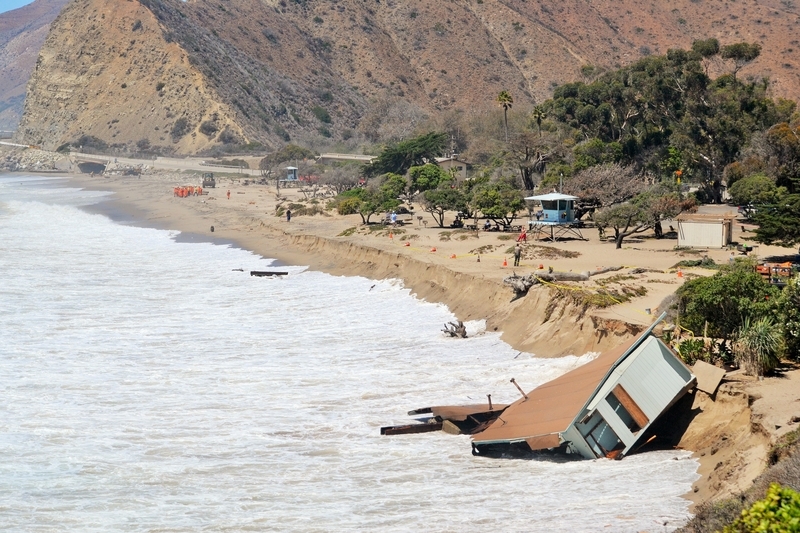 The average erosion for this northern area of Santa Barbara is just two inches per year. Southern California’s highest average rate of erosion is currently around Santa Monica, where they lose about four inches per year. However, parts of the Santa Monica region are under more extreme threat, like the area around the Big Rock Mesa landslide, which devastated 250 homes in 1983. The coastlines of Oceanside and San Diego average two inches of erosion per year. Slightly higher rates of erosion occur in these regions near Poche Beach, Point Loma Nazarene College and Torrey Pines State Beach, where a sinking bluff caused the death of a tourist in 2008. What can homeowners and their agents do? Concerned homeowners can view a map of anticipated sea level rise expected to affect their specific stretch of shoreline. Agents and their clients can check out the U.S. Geological Survey’s Shoreline Change Project map to see if their property is at risk of being swallowed by the ocean in the coming years. (Tip: From the map’s menu bar, click on Base Maps and choose the street view to make the most of the map). If a homeowner lives near the edge of a cliff, one practice to avoid is over-irrigation. On one hand, some deep-rooted plants are helpful in preventing landslides. On the other, too much watering of plants or crops near a cliff’s edge causes the rock to weaken, as often occurs in California’s dry months, according to the U.S. Geological Survey. Runoff also needs to be correctly channeled; otherwise this too can weaken the cliff’s features. A geological engineer may be consulted to ensure proper water usage for cliff-side homes. Is there insurance against sea level rise? Not really. 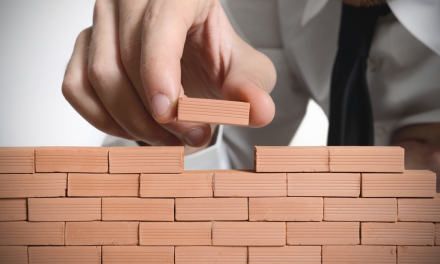 Typical home insurance policies won’t cover any type of land erosion. The reasoning is that erosion occurs over a length of time, and insurance is meant to cover sudden losses. However, erosion due to flooding is covered under most forms of flood insurance (excluding FEMA’s low-cost flood insurance program). Flood insurance may also cover water damage due to storms worsened by sea level rise. But the gradual wearing away of California’s coast is not covered by flood insurance. 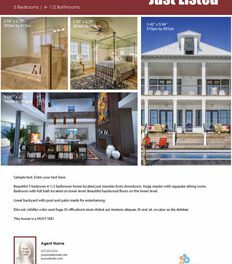 It’s important for homebuyers to do the research before buying a home on the coast, because there is rarely recourse against erosion. In fact, the Coastal Commission warns that homeowners ought to be fully aware and responsible for building in these “hazardous” areas. Further, a real estate agent representing a seller aware of erosion on the property has a duty to disclose this knowledge to buyer. If the seller is unaware of erosion and if it is not discovered by a home inspection, the agent is not liable for erosion later occurring on the property. However, if the erosion is known to cause changes to features which may not be part of the property under consideration, but influence the home’s value (i.e. sidewalks, landscape features), then it is a material fact and needs to be disclosed. If the buyer or buyer’s agent notices a neighbor’s property affected by erosion, they need to examine whether the property under consideration may also be affected. However, just because the neighboring property is suffering erosion doesn’t necessarily mean all nearby properties will experience the same fate. That particular property may have been constructed with no retaining wall or with a poor foundation. It’s always a case by case basis and the buyer needs to consult with an experienced home inspector or call in a soil expert to analyze the potential for erosion. Will sea level rise influence home sales? Only in rare cases will the effects of sea level rise cause a difference in home sales. Local housing markets along the coast may see a momentary decline in home values when stories of erosion make the news. But affected homes will be located right along the coast, meaning a very limited number of homes will experience any noticeable difference. However, urban centers prone to sea level rise — San Francisco — need to continue measures to abate flooding and erosion. The Bay Area can look to Hurricane Katrina’s incredible impact on New Orleans or the destruction wrought in New York City by Hurricane Sandy for examples of what will happen if no action is taken. New Orleans has since implemented new defenses against the destructive forces of water, which coastal cities everywhere can learn from. Without preventive measures, scores of homes will be vulnerable in the low-lying Bay Area. All the same, this is unlikely to deter homebuyers determined to buy along the coast. These homebuyers are very wealthy (by necessity) and in most cases can afford to sell and move if sea level rise and erosion show signs of overtaking their properties. The stunning views and peaceful weather along the coast come at a price, and many are willing to pay for it. Look for the next article in this series, which will explain how earthquakes may influence California’s housing market. To read Part I of the series, see: Drought. “…satellite data shows no global warming since the last large El Niño event in 1998.” Beginning an analysis with an event such as the 1997-1998 El Nino event which was the strongest on record at the time, can easily skew the climate trend. Weather is about what happens over a short period of time and climate is over a much longer period of time encompassing many weather events. One cannot take a handful of years to debate that something is or isn’t happening. An aggregate of data sets, observations, models, etc. taken over decades and preferably over hundreds or thousands of years is what is needed to observe a trend. The satellite data that is often cited was formulated from satellite tropospheric data sets used by physicist Carl Mears who concluded that the rate of warming may be slowing but also that this type of satellite data is prone to “structural uncertainty” more than data that uses surface temperature. Mears has stated that his conclusions does not render the idea of global warming invalid. In any case, any model results from any source is only as good as the data that is input. Whether the earth is experiencing warming or cooling, and/or whether it is exacerbated by humans, does not negate the real facts of coastal erosion and the need for a potential homeowner to have enough information to make intelligent decisions on a purchase that will most likely affect their lives and property for decades to come. I remember back in the 1990’s the global warming alarmists were predicting the sea ice in the North Pole would be gone by now, polar beArs would be going extinct, and sea levels would have alredy risen 4-5 feet. Truth is satellite data shows no global warming since the last large El Niño event in 1998. Another absurd set of predictions from the special interests profiting from the publics’ ignorance about climate change. The fact is sea levels have been rising ever since the end of the last ice age, and continue to do so at a slow and predictable rate (about 8 inches per hundred years). The idea that sea levels will suddenly rise 4-5 feet over the next 100 years is pure fiction.